This quick and easy chorizo topping is a fantastic alternative to good old baked beans when piled onto hot toast. This meal provides 322 kcal, 18g protein, 32g carbohydrate (of which 5g sugars), 14g fat (of which 5g saturates), 5g fibre and 1.7g salt per portion. Place a saucepan over a medium heat. When the pan is hot, add the chorizo and fry for 1-2 minutes, or until starting to crisp. Add the drained chickpeas and tinned tomatoes, then stir in the thyme. Season, to taste, with salt and freshly ground black pepper. Simmer for 4-5 minutes, or until the sauce has warmed through and thickened to your liking. 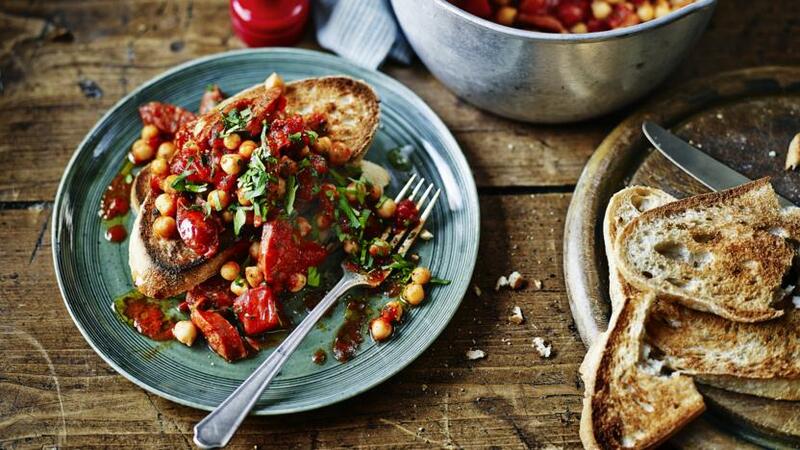 To serve, spoon the chickpea mixture on top of the toast and garnish with parsley.